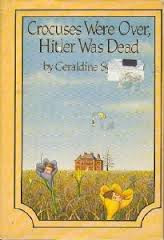 Crocuses Were Over, Hitler Was Dead, by Geraldine Symons (1977). The old house has been empty for years, sitting in its English gardens, waiting...and now it's being opened up again, as tourist attraction. Jassy is there to see it happen--she's staying in the cottage of the head gardener and his wife, while her little siblings recover from mumps. As she explores the gardens, she meets a young man and his dogs, and they talk. But when she gets back to the cottage, she realizes that there is a strangeness to her new friend. There were crocus were blooming when she met him first, and he was worried about Hitler...and the crocuses are over, and Hitler is dead. Slowly realizing that she's slipping back in time, she gradually finds out more about her new friend, facing a war that's about to destroy the peace of the old garden. But why is he sometimes so kind and thoughtful, other times so wild and heedless? It's not much of a mystery, and not much of a plot, qua plot. But it is magical, and beautiful, and makes pictures in the mind. If you like gentle, very English, timeslip stories in which the only immediate tensions are small ones, you will enjoy this. Jassy never has to actually do something (except keep past and present clear in her mind, so she doesn't seem strange and isn't a nuisance to the nice couple she's staying with), but it's a pleasure to explore the old house and its gardens with her. There is, though, a bit of emotional depth. It's rather poignant, in that gradually Jassy and the reader find out what's going happen to the nice young man in the war, and she can't do a thing about it. So there a sense of sadness...but at least the house and the gardens make it through unscathed. There's a copy for sale on Amazon right now for $1.49, which is a good price to pay for a rather lovely escape from reality. And if you have an old public library whose shelves haven't been ruthlessly weeded, you might be able to find Geraldine Symons books about the adventures two early 20th century (or possibly late 19th century) girls, Pansy and Atalanta, that are well worth reading (especially Miss Rivers and Miss Bridges, in which they infiltrate the suffragette movement). I've had this on my shelves for a while now, but haven't read it yet. Now you've tempted me to it, I'll have to give it a read this summer. Now and Then is a much snappier title, but the other one is evocative. I'm a bit of a sucker for WWII fiction, so this may be an Amazon or AbeBooks purchase. Lovely review! Must get more sleep. Ii read this "Crocodiles Were Over, Hitler Was Dead." Aw, this sounds rather dear. I love the US title better than the UK title, which is a bit unusual for me! I'm trying not to keep acquiring new books, but I'll see if I can get this at my library. From the storage sections maybe.